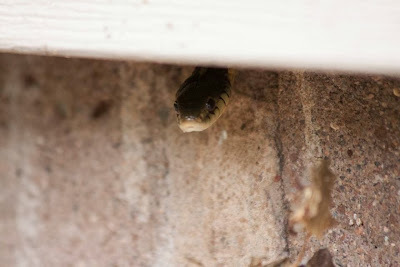 So what would you do when you see a garden snake climb into your front siding, then pop his head out to look at you? Apparently, for me, the answer is take his picture. That's exactly what happened in the above photo because I was so surprised that (one) the snake could fit between the siding and the baseboards of the house and (two) there was a snake in the yard. Usually I go once a season spotting a snake, and as long as they are not venomous, I'm generally ok with them being present in the garden. But along the siding of the house? So I called my husband out to look at the snake. He knelt down to get a better look and the snake stuck his tongue out at him. He then went back inside.